At the inauguration of the Land Escapes exhibition. Photo courtesy of the TCBF. Treviso Comic Book Festival 22nd-25th September 2016, Treviso, Italy. 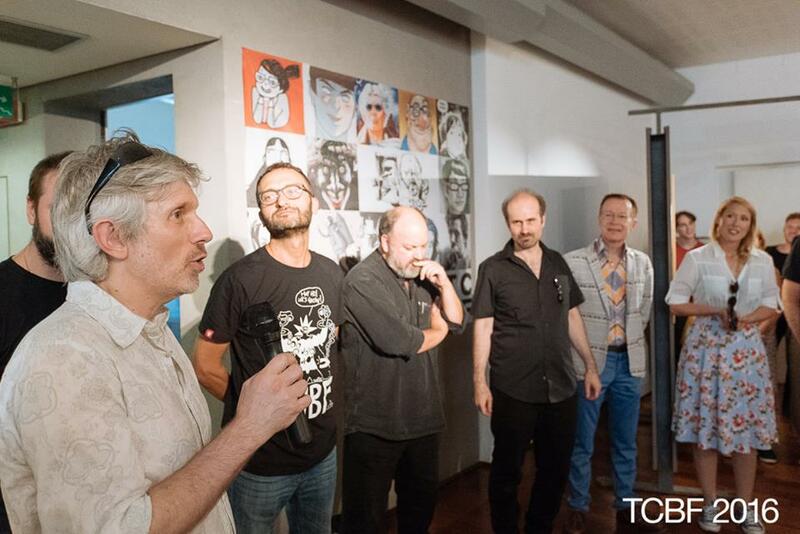 I made my first official comic event appearance last weekend since Thought Bubble in late 2014, foregoing a few more days at the drawing board to accept the incredibly kind invitation from the Treviso Comic Book Festival - to not only attend their show as a guest but to participate in their Land Escapes exhibition. Treviso is a walled city in northern Italy, apparently known as ‘Little Venice’ (although ‘little’ is wildly misleading) and claims to be the birthplace of prosecco and tiramisu. 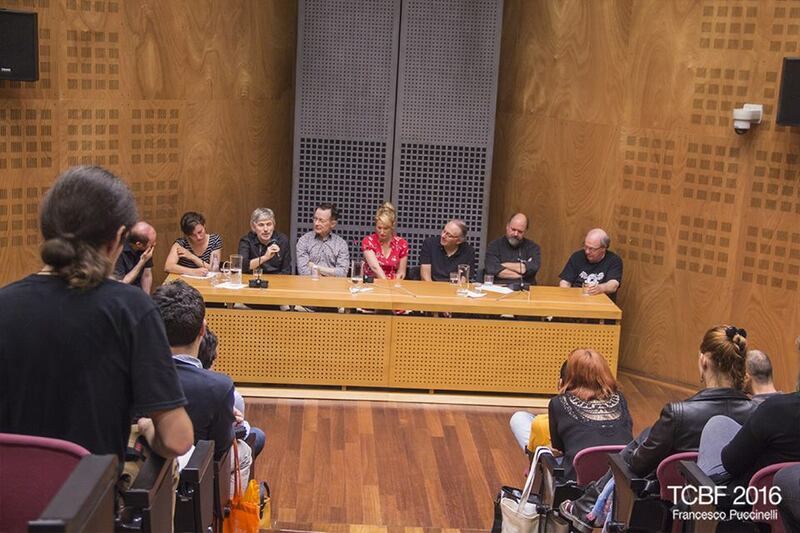 It can now also claim to be the home of one of the largest comics events in Italy, with numerous exhibitions spread out over the centre of the town, a vast comics retailers’ marquee, and the Mostra Mercato comics fair which housed signings, talks, small press and publisher tables. Many of the local retailers participated with window paintings and displays which gave it the feel of a summertime Angouleme festival (despite it being late September, I don’t think I saw a cloud during my three day visit). My friday evening was mostly spent trying to reconcile the size of the measures of drink and the disproportionately low cost which became more difficult as the evening wore on for reasons which I can no longer remember. There appears to be some evidence that I met up with rising global superstar Tula Lotay and her hubby, as well as co-curator of the Land Escapes exhibition Paul Gravett and designer and director of Escape Books, Peter Stanbury. Surprisingly bright-eyed and bushy-tailed the following morning, I walked from the hotel into town with Tula to the inauguration of the exhibition at the prestigious Spazio Bomben Fondazione Benetton, a mere half an hour’s hike in blazing sunshine guided by Mr. Lotay, Google Maps and lagging geopositioning. But we three sweaty blobs arrived at our destination in good time, thanks to the Italian relaxed attitude towards timekeeping, to meet up with fellow British guests Dave McKean, Hunt Emerson and Chris Reynolds. 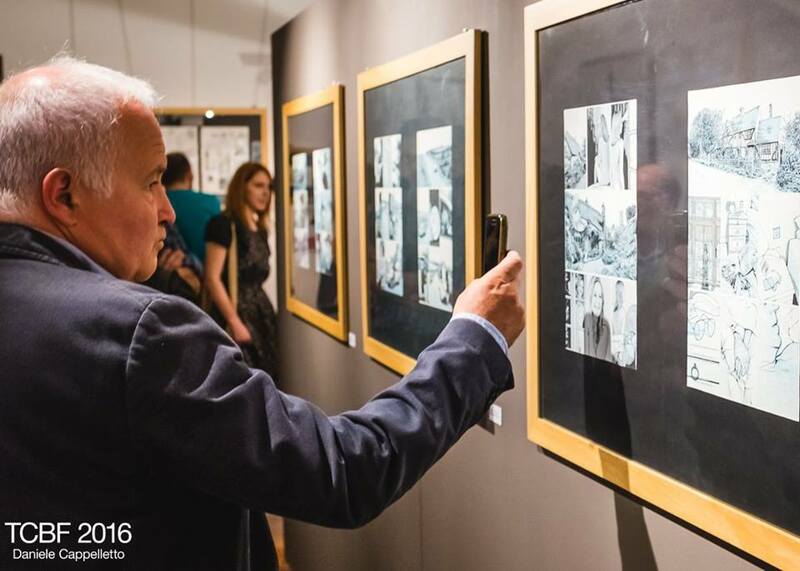 The exhibition was duly opened, featuring a diverse range of British talent including dozens of pages of original artwork by the invited guests as well as Hannah Berry, Brian Bolland, Kate Brown, Stephen Collins, Gemma Correll, Gary Erskine, Tom Gauld, David Lloyd, Sean Phillips, Posy Simmonds, Carol Swain, Bryan Talbot and Andi Watson. This included an impressive eleven pages of Strangehaven originals, guarded on each side by a lifesize Golden Knight cutout, and vast reproductions of artwork by Dave McKean and Tula Lotay with everything elegantly displayed in the sophisticated gallery space. We were each asked to say a few words, and Paul Gravett said many. All was translated by the multi-talented Alberto Corradi, co-curator of the exhibition and coordinator of the British contingent. Photo courtesy of the TCBF. I also managed to catch up with some dear Italian friends including my co-editor on the Alan Moore: Portrait of an Extraordinary Gentleman book, smoky man, audio genius Boris Susanj who I hadn’t seen since the Bristol festival in 2007, and international comics editor Antonio Solinas who I’m sure I see at every event I ever travel to. Next stop was the Mostra Mercato in the formerly abandoned and mysteriously named I.S.R.A.A. building, where there were gazebos set up for signings and talks, numerous publisher rooms offering hundreds of beautiful Italian graphic novels and a courtyard of small press tables boasting a range of high quality material. I picked up a couple of books from the impressive Delebile artist’s collective and would have scooped up many more if I had travelled to Italy with more than just a carry-on bag. Hunt and I signed some books and did some sketching while simultaneously fighting off many persistent yet friendly tiny flies. The official convention guest dinner took place at a traditional Venetian cicchetti restaurant (cicchetti being the Italian version of tapas as I understand it) where much meat was eaten much prosecco was drunk, and where I met for the first time artist extraordinaire Lee Bermejo and the impressively bearded writer Matteo Casali. These guys know how to party hard and we all ended up with the Lotays at some kind of rave at an old Army base in the early hours of sunday morning where I encountered my first glass of grappa (a bit like low grade petroleum, but less pleasant tasting). 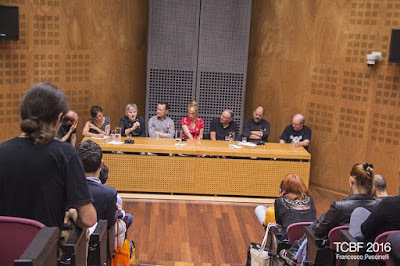 Surprisingly still alive, sunday's duties began with a panel discussion about the exhibition at the Benneton Foundation for press and public, with the full roster of British guests and the curators Alberto and Paul. Translation always slows these discussions down and can disrupt the momentum, but there were some interesting points made. Dave McKean managed to plug his gorgeous new book Black Dog: The Dreams of Paul Nash, Chris Reynolds did his best to promote his home country of Wales, Hunt Emerson articulated his complete indifference towards 2000 AD, Tula Lotay resorted to blatant pandering by professing her love of Italy, Treviso and her fans, while Paul Gravett made some vague insinuations that I was involved in the death of fascist dictator Generalissimo Franco in 1975. Part of going to these events means that you’re more likely to have to stop in the middle of the street en route to lunch to sign a book or do a quick sketch for a reader of your work, but I admit it’s less of a nuisance when she’s young, pretty and Italian. With my ego sated, next up was lunch in a genuine Italian pizzeria where it was my turn to fawn, finally getting to spend some time chatting to the living legend that is Dave McKean, hoping that I might absorb some of his talent via simple proximity and trying to gently rest my head on his shoulder without him noticing. Then there was enough time to buy a cherry gelato and wander out of the city walls for a few minutes to soak up some Venetian sunshine before the final signing and sketching marathon alongside Tula, Chris and Hunt. After which it was on to a wine bar for a last glass of prosecco al fresco, and time for a small bowl of tuna pasta in a beautiful old restaurant before having to dash off to the airport. Festival organiser Alberto Polita kindly collected me from the restaurant and combined performing this mundane duty with auditioning for Fast and the Furious 9. Suffice to say I arrived at the airport on time but unfortunately my flight was delayed by half an hour. After being funnelled into a standing-room-only concrete bunker amusingly described as a ‘departure lounge,’ I had the unexpected pleasure to find two other astonishingly talented British guests of the show, botanical artist Katie Scott and children’s book illustrator Emily Hughes, which helped pass the last hour or so in Italy. Every time I’m invited as a guest to a European festival, it invariably provides me with many indelible memories and Treviso is no different. I didn’t even make the short train trip to Venice, but I am already plotting a trip to combine sightseeing with another festival visit within the next year or two. There are more photos in my Treviso album on Facebook. The Land Escapes exhibition runs until 9th October 2016. Poster for Land Escapes exhibition, all images ©2016 copyright their respective creators. 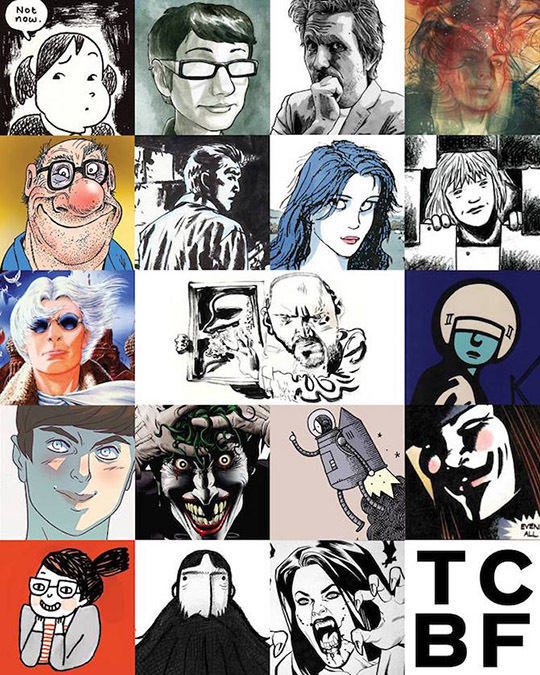 In what will probably be my sole “official” appearance this year, I will be a guest at the Treviso comic festival this upcoming weekend 23-25 September. I don’t have any details of signings or talks to hand, but I suspect I’ll be doing a little of both. I’ll be humbled in the company of my fellow guest Brits Hunt Emerson, Tula Lotay, Dave McKean and Chris Reynolds, masters of the sequential arts, all. I’ll also have an unusually large number of pages of original artwork on display in the festival’s related exhibition, Land Escapes: Visions and escapes from the United Kingdom at the prestigious Fondazione Benetton Studi Ricerche. The exhibition also features artwork from Hannah Berry, Brian Bolland, Kate Brown, Stephen Collins Illustration and Comics, Gemma Correll, Hunt Emerson, Gary Erskine, Tom Gauld, David Lloyd, Tula Lotay, Dave McKean, Sean Phillips, Chris Reynolds, Posy Simmonds, Carol Swain, Bryan Talbot and Andi Watson. Not only will I be seeing some old Italian friends again, but I’ll also get to reestablish my relationship with former Black Velvet editor Alberto Corradi (who worked on the Italian language editions of Strangehaven) who’s one of the organisers of the festival and is also co-curating the exhibition with the UK’s own Paul Gravett. Well, not so much cryptic as scant. And unfortunately I can’t flesh out those bare bones with any further information at present, so if you have any questions, it might be more fruitful to direct them towards Soaring Penguin rather than myself. Suffice to say that I do strongly suspect Strangehaven will form part of the aforementioned issue 5.